While at the hair salon this week (yes, I go faithfully every two weeks), I was speaking to another woman who was sharing that she was looking forward to the flowers that she had ordered delivered to herself for Valentine's Day. The two of us and the salon owner had a good chuckle over this. However, as we began to discuss her motives further, it became apparent that she was serious about doing something for herself to mark this occasion. She had a Significant Other but felt that rather than wait for someone else to show their love for her, she would show love for herself. Her words were, "no one knows how I like to be loved better than I do so I chose to do something beautiful for myself." 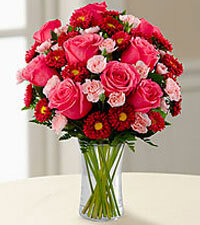 She shared how much she was looking forward to her flower delivery and the special note she'd written for herself. Her face lit up with excitement. Then the salon owner revealed that she was taking herself to a jazz concert on Valentine's Day night. I was so uplifted that these strong, beautiful (and I do mean beautiful) ladies were choosing to do something positive to show their love for themselves. We can each learn a lesson in self-love from them because we can't always expect love to come from outside of us. Sometimes you have to do something just for you.